On our drive back from Western States two weeks ago, the idea formed. Three days later my wife gave notice at work. The next day we put our home up for rent on craigslist. Within hours we connected with an awesome ultrarunner moving to Ashland who is now taking good care of our home! Since then we have spent every last minute packing up our home, many a car load to goodwill, several bags of extra running clothes accumulated over the years to a local cross country team, de-cluttering our house and life as we begin the next chapter. Checking out our trusty The North Face tent! We are looking forward to camping and being in the silence and sounds of nature. Waking up when the sun shines and going to bed more on Tristan’s schedule or when the sun goes down. A little less TV, a few more books. Some good conversations. Contemplation. Watching my boy grow who is soon going to be a year old and learning from him; living simple and enjoying each moment. 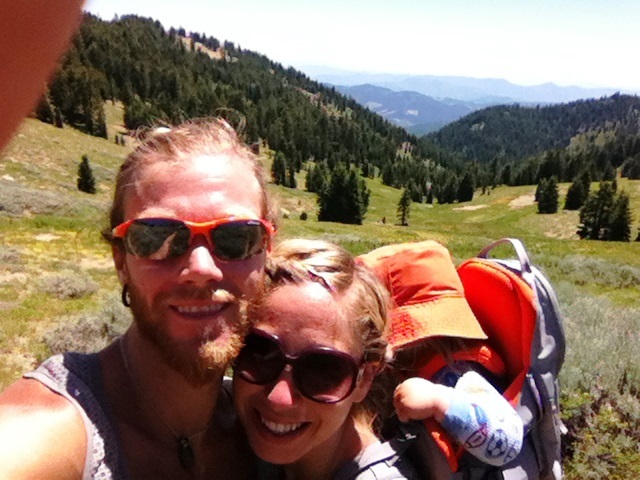 Lots of time on the trails – solo long runs, mountain hikes with Tristan on my back, and a sprinkle of family running with all three of us and the BOB stroller to balance it all out. Ashland is our home and community filled with good friends and my backyard trails. It will be our home base between our travels but it is always fun to explore other places. We’re not sure where this might take us. I have plenty of races and travels to keep us busy over the next months. In between travels, we will be winging it, camping, with everything we need in our car, allowing us to visit towns, trails, and friends all over. So as we hit the open road, energy courses through me. I’m not sure what is to come but I have my family by my side so life can only get better. I look forward to meeting old and new friends along the way – maybe I’ll see you out there. This entry was posted in running, ultra, new year,, Uncategorized and tagged camping, Injinji, Natura Health, running, The North Face, Ultra running. Bookmark the permalink. Sounds like adventure awaits you. I just passed through Ashland the other day. What a great place, but there are many more!. Good luck. Good luck brotha! That sounds amazing. Wishing you and yours best wishes. Congrats on the WS win!! If you ever end up in upstate ny get at me for accommodations. Hope all is well. Oct 8-18. You are welcome to stay here if you like. Also Nov is wide open. Let us know. Thank you so much! We’re actually planning on being in that area around then. I’ll let you know when it’s in our plans. I know you have family and probably plenty of friends in Wisco, but if you’re in Madison I’d be happy to run some trails with you. Enjoy the adventure! What an interesting blog to open and read today as I am packing my house that I have rented to a friend and her little ones while my daughter heads to college and I head to grad school, not to live in tents but to live different lifestyles and have different experiences on the other end of a child’s life. Your writings are always timely and inspiring and only add to the blessings I feel having lived and run in southern Oregon. Thank you once again and safe travels and great adventures to you and your family. It’s all one wild and crazy journey however it unfolds for each of us. Have a great time in grad school! Hope to see you in Amherst Tim and family. Thx for sharing Timothy. You are an awesome runner & a great inspiration since I’ve started trail running. Come through North East Iowa on your way anywhere and we’ll take care of you! If you ever need a place in S. Florida, hit me up. If you come to a fork in the road… take it. Bestestest wishes and big ups for W.S. LOVE your write up and way to end it with a RAD blurb from Dr. Seuss! CARPE DIEM! You have a place in the Gorge if your travels bring you this way! Happy travels through and through! thanks for being so true and inspiring! Good luck Tim and enjoy the adventure! What a great start for your wee boy too. If your travels bring you to New Zealand my family and I would be happy to help out any way we can… Also hope to see you back down here to take on Mr Canaday again next year…brilliant run at Tarawera! I appreciate the the kind words and invitation to New Zealand, I’ll be back one day for-sure. Thank you sooo much Lynette! I’m sure you’re having a blast, what good times for you and your family. I look to do the same; time together and good memories. all the best to you and the fam.